Gastroesophageal reflux disease (GERD), also known as acid reflux, is a long term condition where stomach contents come back up into the esophagus resulting in either symptoms or complications. Symptoms include the taste of acid in the back of the mouth, heartburn, bad breath, chest pain, vomiting, breathing problems, and wearing away of the teeth. Complications include esophagitis, esophageal strictures, and Barrett's esophagus. Treatment is typically via lifestyle changes, medications, and sometimes surgery. Lifestyle changes include not lying down for three hours after eating, losing weight, avoiding certain foods, and stopping smoking. Medications include antacid, H2 receptor blockers, proton pump inhibitors, and prokinetics. Surgery may be an option in those who do not improve with other measures. In the Western world between 10 and 20% of the population are affected by GERD. Gastroesophageal reflux (GER) once in awhile, without significant symptoms or complications, is more common. The condition was first described in 1935 by Asher Winkelstein. The classic symptoms had been described earlier in 1925. The most-common symptoms of GERD in adults are heartburn, an acidic taste in the mouth, and regurgitation. Less-common symptoms include pain with swallowing/sore throat, increased salivation (also known as water brash), nausea, chest pain, and coughing. Certain foods and lifestyle are considered to promote gastroesophageal reflux, but most dietary interventions have little supporting evidence. Avoidance of specific foods and of eating before lying down should be recommended only to those in which they are associated with the symptoms. Foods that have been implicated include coffee, alcohol, chocolate, fatty foods, acidic foods, and spicy foods. Weight loss and elevating the head of the bed are generally useful. Moderate exercise improves symptoms; however in those with GERD vigorous exercise may worsen them. Stopping smoking and not drinking alcohol do not appear to result in significant improvement in symptoms. The standard surgical treatment for severe GERD is the Nissen fundoplication. In this procedure, the upper part of the stomach is wrapped around the lower esophageal sphincter to strengthen the sphincter and prevent acid reflux and to repair a hiatal hernia. It is recommended only for those who do not improve with PPIs. Benefits are equal to medical treatment in those with chronic symptoms. In addition, in the short and medium term, laparoscopic fundoplication improves quality of life compared to medical management. When comparing different fundoplication techniques, partial posterior fundoplication surgery is more effective than partial anterior fundoplication surgery. 1 2 3 4 5 6 7 8 "Gastroesophageal Reflux (GER) and Gastroesophageal Reflux Disease (GERD) in Adults". NIDDK. November 13, 2014. Retrieved 13 September 2016. ↑ Kahrilas, PJ; Shaheen, NJ; Vaezi, MF; American Gastroenterological Association, Institute; Clinical Practice and Quality Management, Committee (October 2008). "American Gastroenterological Association Institute technical review on the management of gastroesophageal reflux disease.". Gastroenterology. 135 (4): 1392–1413, 1413.e1–5. PMID 18801365. 1 2 3 4 5 6 7 8 9 Hershcovici T, Fass R (April 2011). "Pharmacological management of GERD: where does it stand now?". Trends in pharmacological sciences. 32 (4): 258–64. doi:10.1016/j.tips.2011.02.007. PMID 21429600. ↑ Arcangelo, Virginia Poole; Peterson, Andrew M. (2006). Pharmacotherapeutics for Advanced Practice: A Practical Approach. Lippincott Williams & Wilkins. p. 372. ISBN 9780781757843. ↑ Granderath, Frank Alexander; Kamolz, Thomas; Pointner, Rudolph (2006). Gastroesophageal Reflux Disease: Principles of Disease, Diagnosis, and Treatment. Springer Science & Business Media. p. 161. ISBN 9783211323175. ↑ Zajac P, Holbrook A, Super ME, Vogt M (March–April 2013). "An overview: Current clinical guidelines for the evaluation, diagnosis, treatment, and management of dyspepsia". Osteopathic Family Physician. 5 (2): 79–85. doi:10.1016/j.osfp.2012.10.005. 1 2 3 Kahrilas PJ (2008). "Gastroesophageal Reflux Disease". The New England Journal of Medicine. 359 (16): 1700–7. doi:10.1056/NEJMcp0804684. PMC 3058591 . PMID 18923172. 1 2 Wang KK, Sampliner RE (March 2008). "Updated guidelines 2008 for the diagnosis, surveillance and therapy of Barrett's esophagus" (PDF). Am J Gastroenterol. 103 (3): 788–97. doi:10.1111/j.1572-0241.2008.01835.x. PMID 18341497. ↑ "Spitting Up in Babies". familydoctor.org. ↑ and Barrett's Esophagus. Retrieved on 2009-02-01. ↑ "Patient information: Barrett's esophagus (Beyond the Basics)". June 2009. ↑ Sontag SJ (1999). "Defining GERD". Yale J Biol Med. 72 (2–3): 69–80. PMC 2579007 . PMID 10780568. ↑ Piesman M, Hwang I, Maydonovitch C, Wong RK (2007). "Nocturnal reflux episodes following the administration of a standardized meal. Does timing matter?". Am J Gastroenterol. 102 (10): 2128–34. doi:10.1111/j.1572-0241.2007.01348.x. PMID 17573791. ↑ Ayazi S; Crookes PF; Peyre CG; et al. (2007). "Objective documentation of the link between gastroesophageal reflux disease and obesity". Am J Gastroenterol. 102 (S2): 138–9. doi:10.1111/j.1572-0241.2007.01491_1.x. ↑ Ayazi S, Hagen JA, Chan LS, DeMeester SR, Lin MW, Ayazi A, Leers JM, Oezcelik A, Banki F, Lipham JC, DeMeester TR, Crookes PF (August 2009). "Obesity and Gastroesophageal Reflux: Quantifying the Association Between Body Mass Index, Esophageal Acid Exposure, and Lower Esophageal Sphincter Status in a Large Series of Patients with Reflux Symptoms". J. Gastrointest. Surg. 13 (8): 1440–7. doi:10.1007/s11605-009-0930-7. PMC 2710497 . PMID 19475461. ↑ Morse CA, Quan SF, Mays MZ, Green C, Stephen G, Fass R (2004). "Is there a relationship between obstructive sleep apnea and gastroesophageal reflux disease?". Clin. Gastroenterol. Hepatol. 2 (9): 761–8. doi:10.1016/S1542-3565(04)00347-7. PMID 15354276. ↑ Kasasbeh A, Kasasbeh E, Krishnaswamy G (2007). "Potential mechanisms connecting asthma, esophageal reflux, and obesity/sleep apnea complex—a hypothetical review". Sleep Med Rev. 11 (1): 47–58. doi:10.1016/j.smrv.2006.05.001. PMID 17198758. ↑ O'Connor HJ (Feb 1999). "Helicobacter pylori and gastro-oesophageal reflux disease-clinical implications and management". Aliment Pharmacol Ther. 13 (2): 117–27. doi:10.1046/j.1365-2036.1999.00460.x. PMID 10102940. ↑ El-Omar EM, Oien K, El-Nujumi A, Gillen D, Wirz A, Dahill S, Williams C, Ardill JE, McColl KE (1997). "Helicobacter pylori infection and chronic gastric acid hyposecretion". Gastroenterology. 113 (1): 15–24. doi:10.1016/S0016-5085(97)70075-1. PMID 9207257. ↑ Fallone CA, Barkun AN, Mayrand S, Wakil G, Friedman G, Szilagyi A, Wheeler C, Ross D (2004). "There is no difference in the disease severity of gastro-oesophageal reflux disease between patients infected and not infected with Helicobacter pylori". Aliment Pharmacol Ther. 20 (7): 761–8. doi:10.1111/j.1365-2036.2004.02171.x. PMID 15379836. 1 2 3 4 5 6 7 8 9 10 11 12 13 14 15 Katz PO, Gerson LB, Vela MF (March 2012). "Guidelines for the diagnosis and management of gastroesophageal reflux disease.". The American journal of gastroenterology. 108 (3): 308–28. doi:10.1038/ajg.2012.444. PMID 23419381. 1 2 3 4 5 6 7 Kahrilas PJ, Shaheen NJ, Vaezi MF, Hiltz SW, Black E, Modlin IM, Johnson SP, Allen J, Brill JV (October 2008). "American Gastroenterological Association Medical Position Statement on the management of gastroesophageal reflux disease". Gastroenterology. 135 (4): 1383–1391, 1391.e1–5. doi:10.1053/j.gastro.2008.08.045. PMID 18789939. ↑ Numans ME, Lau J, de Wit NJ, Bonis PA (April 2004). "Short-term treatment with proton-pump inhibitors as a test for gastroesophageal reflux disease: a meta-analysis of diagnostic test characteristics" (PDF). Annals of Internal Medicine. 140 (7): 518–27. doi:10.7326/0003-4819-140-7-200404060-00011. PMID 15068979. 1 2 Festi D, Scaioli E, Baldi F, Vestito A, Pasqui F, Di Biase AR, Colecchia A (Apr 14, 2009). "Body weight, lifestyle, dietary habits and gastroesophageal reflux disease". World journal of gastroenterology : WJG. 15 (14): 1690–701. doi:10.3748/wjg.15.1690. PMC 2668774 . PMID 19360912. 1 2 Kaltenbach T, Crockett S, Gerson LB (2006). "Are lifestyle measures effective in patients with gastroesophageal reflux disease? An evidence-based approach". Arch. Intern. Med. 166 (9): 965–71. doi:10.1001/archinte.166.9.965. PMID 16682569. 1 2 Tran T, Lowry AM, El-Serag HB (2007). "Meta-analysis: the efficacy of over-the-counter gastro-oesophageal reflux disease drugs". Aliment Pharmacol Ther. 25 (2): 143–53. doi:10.1111/j.1365-2036.2006.03135.x. PMID 17229239. ↑ Abbas AE, Deschamps C, Cassivi SD, Allen MS, Nichols FC, Miller DL, Pairolero PC (2004). "The role of laparoscopic fundoplication in Barrett's esophagus". Annals of Thoracic Surgery. 77 (2): 393–6. doi:10.1016/S0003-4975(03)01352-3. PMID 14759403. ↑ Wileman SM, McCann S, Grant AM, Krukowski ZH, Bruce J (2010). Wileman SM, ed. "Medical versus surgical management for gastro-oesophageal reflux disease (GORD) in adults". Cochrane database of systematic reviews (Online). 3 (3): CD003243. doi:10.1002/14651858.CD003243.pub2. PMID 20238321. ↑ Kurian AA, Bhayani N, Sharata A, Reavis K, Dunst CM, Swanström LL (January 2013). "Partial anterior vs partial posterior fundoplication following transabdominal esophagocardiomyotomy for achalasia of the esophagus: meta-regression of objective postoperative gastroesophageal reflux and dysphagia". JAMA Surg. 148 (1): 85–90. doi:10.1001/jamasurgery.2013.409. PMID 23324843. ↑ Badillo, Raul (2014). "Diagnosis and treatment of gastroesophageal reflux disease". World Journal of Gastrointestinal Pharmacology and Therapeutics. 5 (3): 105. doi:10.4292/wjgpt.v5.i3.105. ↑ Jain, D; Singhal, S (March 2016). "Transoral Incisionless Fundoplication for Refractory Gastroesophageal Reflux Disease: Where Do We Stand?". Clinical endoscopy. 49 (2): 147–56. doi:10.5946/ce.2015.044. PMC 4821522 . PMID 26878326. ↑ Hopkins, J; Switzer, NJ; Karmali, S (25 August 2015). "Update on novel endoscopic therapies to treat gastroesophageal reflux disease: A review.". World journal of gastrointestinal endoscopy. 7 (11): 1039–44. doi:10.4253/wjge.v7.i11.1039. PMC 4549661 . PMID 26322157. ↑ Mahadevan U, Kane S (July 2006). "American gastroenterological association institute medical position statement on the use of gastrointestinal medications in pregnancy". Gastroenterology. 131 (1): 278–82. doi:10.1053/j.gastro.2006.04.048. PMID 16831610. ↑ Infant acid reflux. MayoClinic.com (2013-03-28). Retrieved on 2013-09-27. ↑ Tighe MP, Afzal NA, Bevan A, Beattie RM (2009). "Current pharmacological management of gastro-esophageal reflux in children: an evidence-based systematic review". Paediatr Drugs. 11 (3): 185–202. doi:10.2165/00148581-200911030-00004. PMID 19445547. ↑ van der Pol RJ, Smits MJ, van Wijk MP, Omari TI, Tabbers MM, Benninga MA (May 2011). "Efficacy of proton-pump inhibitors in children with gastroesophageal reflux disease: a systematic review". Pediatrics. 127 (5): 925–35. doi:10.1542/peds.2010-2719. PMID 21464183. 1 2 Here is a plain English explanation, followed by specific studies. Heidelbaugh JJ, Kim AH, Chang R, Walker PC (2012). "Overutilization of proton-pump inhibitors: What the clinician needs to know". Therapeutic Advances in Gastroenterology. 5 (4): 219–232. doi:10.1177/1756283X12437358. PMC 3388523 . PMID 22778788. Forgacs I, Loganayagam A (2008). "Overprescribing proton pump inhibitors". BMJ. 336 (7634): 2–3. doi:10.1136/bmj.39406.449456.BE. PMC 2174763 . PMID 18174564. McKay AB, Wall D (2008). "Overprescribing PPIs: An old problem". BMJ. 336 (7636): 109. doi:10.1136/bmj.39458.462338.3A. PMC 2206261 . PMID 18202040. ↑ Fedorak RN, Veldhuyzen van Zanten S, Bridges R (July 2010). "Canadian Digestive Health Foundation Public Impact Series: Gastroesophageal reflux disease in Canada: Incidence, prevalence, and direct and indirect economic impact". Canadian Journal of Gastroenterology. 24 (7): 431–4. PMC 2918483 . PMID 20652158. Lay summary. ↑ Jafri SM, Arora G, Triadafilopoulos G (July 2009). 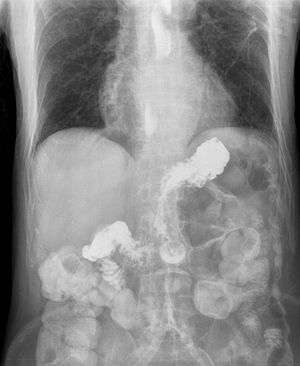 "What is left of the endoscopic antireflux devices?". Current Opinion in Gastroenterology. 25 (4): 352–7. doi:10.1097/MOG.0b013e32832ad8b4. PMID 19342950. ↑ Lipka, S; Kumar, A; Richter, JE (June 2015). "No evidence for efficacy of radiofrequency ablation for treatment of gastroesophageal reflux disease: a systematic review and meta-analysis.". Clinical Gastroenterology and Hepatology. 13 (6): 1058–67.e1. doi:10.1016/j.cgh.2014.10.013. PMID 25459556. ↑ Perry, KA; Banerjee, A; Melvin, WS (August 2012). "Radiofrequency energy delivery to the lower esophageal sphincter reduces esophageal acid exposure and improves GERD symptoms: a systematic review and meta-analysis.". Surgical laparoscopy, endoscopy & percutaneous techniques. 22 (4): 283–8. doi:10.1097/sle.0b013e3182582e92. PMID 22874675. ↑ Testoni PA, Vailati C (August 2012). "Transoral incisionless fundoplication with EsophyX® for treatment of gastro-oesphageal reflux disease". Digestive and Liver Disease. 44 (8): 631–5. doi:10.1016/j.dld.2012.03.019. PMID 22622203.